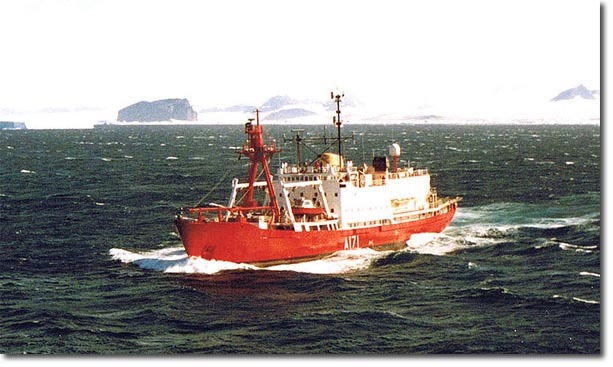 HMS Endurance was an ice breaker that provided the primary evidence of British commitment to the islands in the 1970s and early 80s. She replaced HMS Protector with six monthly patrols to the South Atlantic, Falkland Islands, South Georgia and Antarctic bases from 1968. It generally arrived in the islands mid to late November each year and used Stanley as a base to service the other dependencies and to conduct hydrographic surveys. It carried a Royal Marines detachment and had armaments n the form of 20mm cannons and two helicopters. It usually returned to the UK at the end of the Antarctic summer in about March or April. From the late 1970s, the MOD tried to have HMS Endurance scrapped for budgetary reasons. It was the Conservative Government plans to have her scrapped in 1982 that helped convince Galtieri's Junta that British commitment to the islands was waning.